National Corporate Teams make a meaningful difference by raising awareness about cystic fibrosis and supporting the Cystic Fibrosis Foundation’s mission to find a cure for CF. If you have the ability and opportunity to introduce a new National Corporate Team to join our roster, we want to hear from you! Let’s work together. It’s good business! In 2018, National Corporate Teams raised $2.3 million and together are making a difference in the lives of individuals living with cystic fibrosis. Through their powerful stories and inspiring courage, people living with cystic fibrosis motivate us every day to come together to fight this chronic disease. 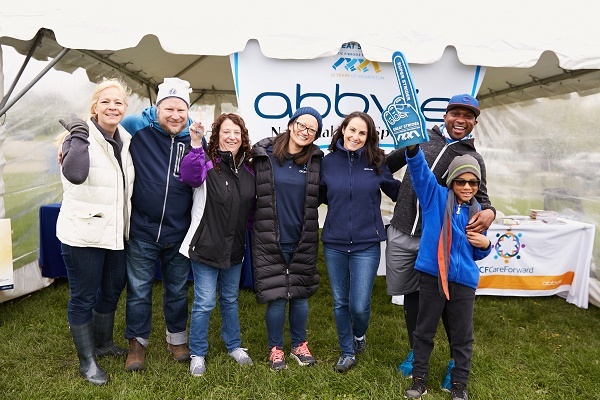 At AbbVie, we are honored to support the Cystic Fibrosis Foundation and the Great Strides fundraising events to help raise awareness about CF. We are grateful to continue collaborating with the CF Community in pursuit of new discoveries and advances in modern medicine that will allow people living with CF to achieve their hopes and dreams beyond expectations. As a National Elite Sponsor for Great Strides, we are deeply passionate about supporting this community and proud to have done so for more than 30 years. Together with the CFF’s family of corporate sponsors, we will walk to overcome the hurdles of CF once and for all.